R-O-Y-G-B-I-V. Almost everyone remembers learning about rainbows and prisms in elementary school, right? Red-Orange-Yellow-Green-Blue-Indigo-Violet: the seven bands of the rainbow; the result of rain + sun in the sky. These hues are also represented in the artist’s color wheel and by the diversity of nature’s flora. 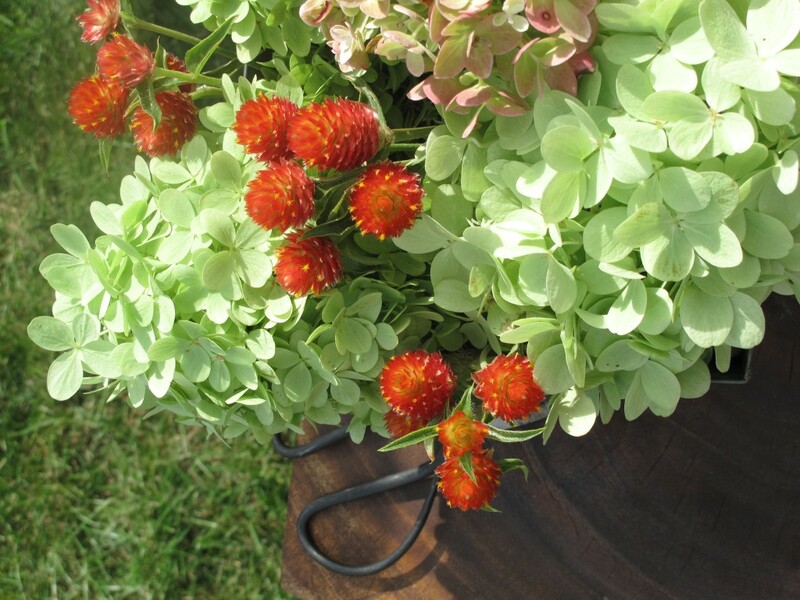 There is an endless variety of flowers and foliage available to the gardener and the floral designer alike. But sometimes, when you’re at the flower stand or even walking through the garden, those beautiful choices can be overwhelming. The Floral Color Wheel helps simplify and organize your design process, guiding you to create harmonious, eye-pleasing arrangements, centerpieces and bouquets, using a fun, paint-by-number approach (or shall we say “paint-by-petal”)? I use all parts of a plant to guide my color choices: Flowers and buds, of course. But also the stems, leaves, pods and berries. And then there’s the selection of vase color, another important variable. When I teach, I tell my floral students that the color wheel is an essential tool in a designer’s toolbox. Knowing the basics: Primary and Secondary colors, and how they relate to each other, is a good starting point. Tertiary colors are the connectors that bring together otherwise disharmonious colors. See the glossary of terms at the end of this post for specifics about each term. There are so many ways to create visual poetry with flowers. Do you want to express dramatic or intense emotions? Go for high contrast with complementary colors. Red and Green are across from one another on the color wheel; they’re called complementary. In the floral world, that pairing might be reinterpreted as maroon with lime – imagine how gorgeous such a combo could look! 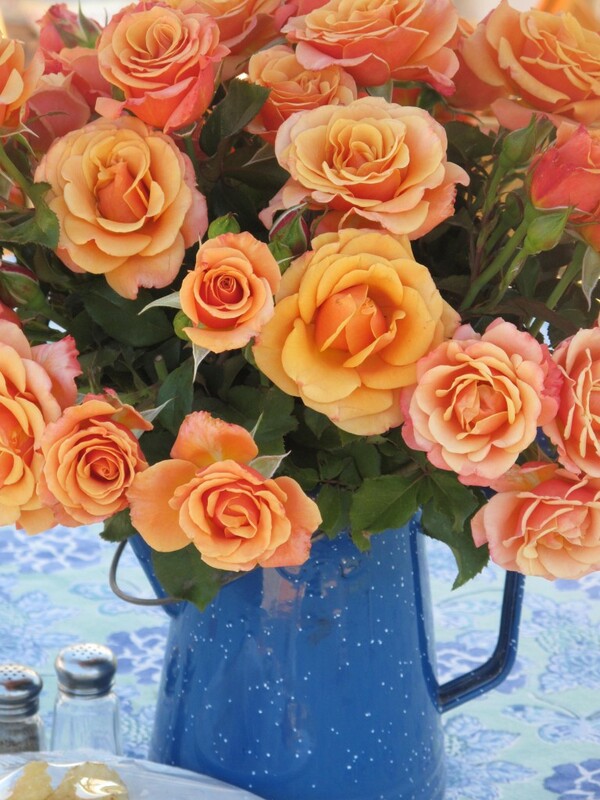 Orange and blue might morph into peach and teal (a very popular wedding palette these days). Yellow and purple can be a zinger in the vase. 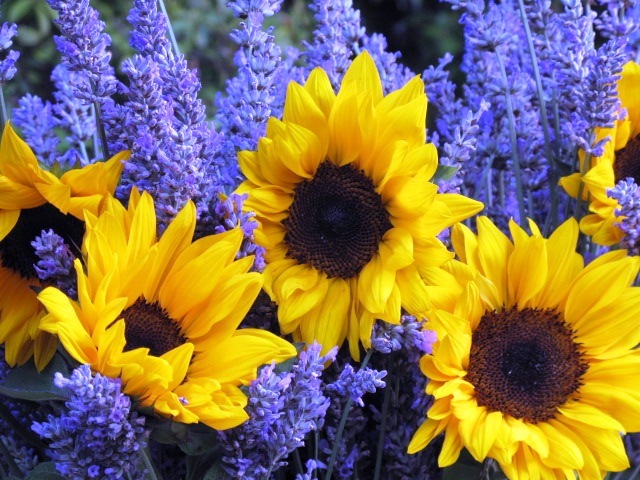 One of my all-time favorite summer bouquets pairs fresh-cut French lavender with field-grown sunflowers – a purple and yellow bouquet that is the perfect example of complementary design. 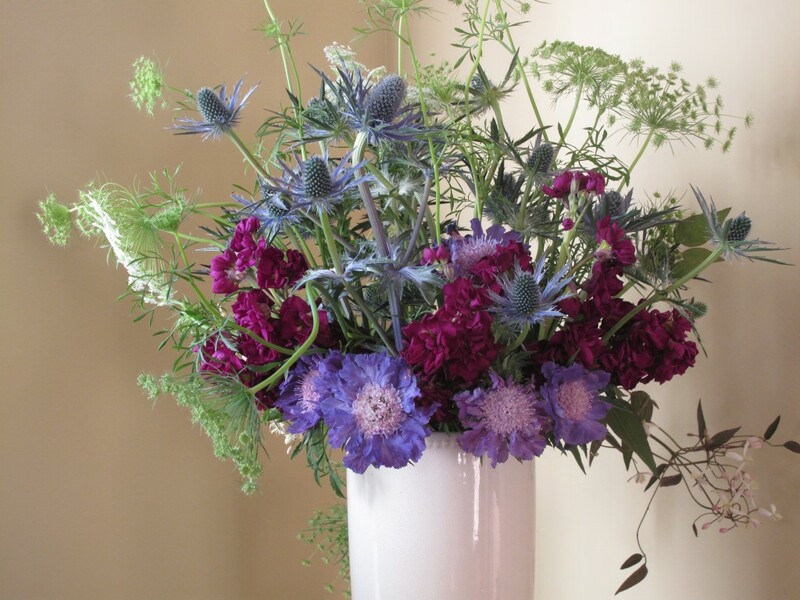 A cool analogous arrangement in a white vase features amethyst sea holly, periwinkle-hued scabiosa, magenta stock and touches of white Queen Anne’s lace. 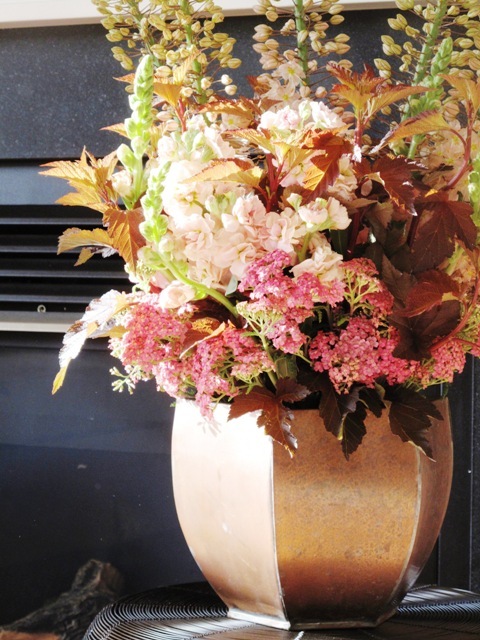 A warm analogous arrangement in a copper flower pot features all values in the apricot-cinnamon family. Out of flowers? Short on funds? That’s when a monochromatic bouquet of all foliage comes to the rescue. Gardeners and florists use the term “greenery” all the time – it’s nature’s neutral shade. But thanks to the many amazing textures, shapes and sizes of leaves in the plant world, you can pull together a monochromatic foliage bouquet with ease — your handy clippers and a walk through the backyard make it possible. The result? A totally unexpected, thoroughly contemporary look. 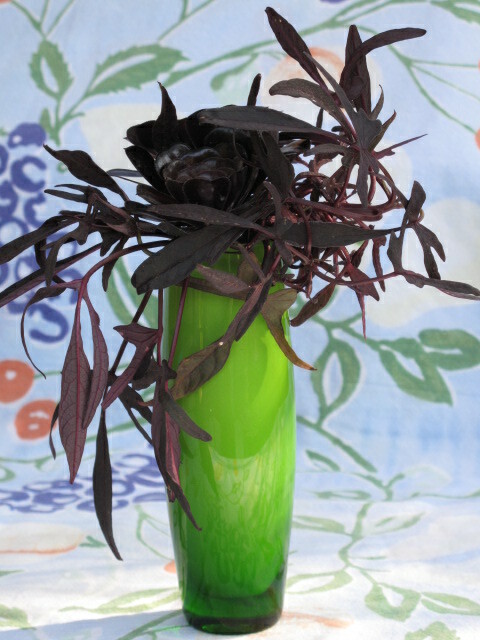 You can try this technique with any color of foliage or flowers – or a combination of both. I created a small but sweet arrangement using a dark-burgundy aeonium (a succulent) and dark purple potato vine. Two completely different plants; same color. Eye-catching design. Here’s another fun monochromatic project that I designed for Better Homes & Gardens a few years back. 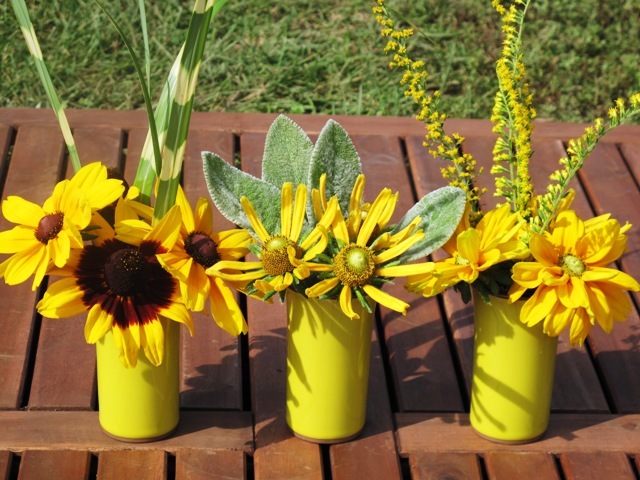 It involves three yellow tumblers, each of which holds different varieties of black-eyed Susan flowers (Rudbeckia sp.) and textural foliage. This type of design allows you to clip bits of this and that from the garden and end up with a cohesive design – thanks to the unifying color theme. 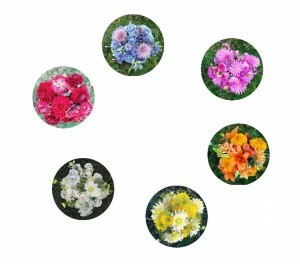 Nature’s stems, buds, petals and leaves make up the Floral Color Wheel. It’s easy to incorporate these elements in your flower centerpieces and bouquets using complementary, analogous and monochromatic pairings. Be inspired by this timeless approach to color. But don’t feel restricted by color “rules.” They are only guidelines, worth breaking. 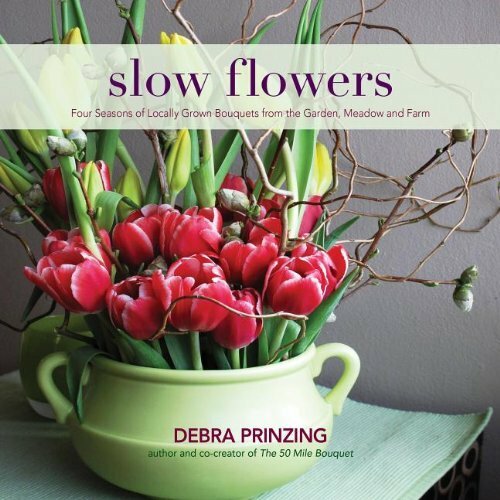 Debra Prinzing is an outdoor living expert and author of seven books, including “Slow Flowers” and “The 50 Mile Bouquet.” You can learn more about her work and find countless design resources at www.debraprinzing.com.